John Bowring - Our Auctioneer Extraordinaire! Our auctioneer John Bowring has had an amazing 100% “under the hammer” track record with our Professionals Inner West team so far this year. Our vendors have been shocked by the levels above reserve he has obtained - in one recent case over $250,000! A great auction outcome is of course a full team effort, similar to a game of rugby - the auctioneer might score the try “under the hammer” but the work that our entire team puts into marketing the property, identifying the interested parties and leaving no stone unturned, is the key to the auctioneer completing the job. 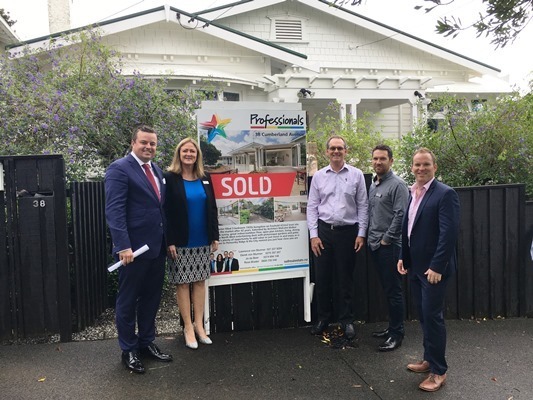 John has been in the real estate industry for almost 18 years, starting out in residential sales before moving into auctioneering where he has specialised for the last nine years. With well over 3000 auction calls to his credit, John’s undoubted strengths are his calling and negotiating skills mid auction. John has been the national auctioneer for Colliers International for more than six years, and is now running his own business - Elite Auctioneers. John’s professionalism and desire to always be improving means he is recognised as one of New Zealand’s leading auctioneers. He is a competitor in the REINZ Auctioneers Championships and featured as a finalist in 2012, 2014 and 2015, and last year was also awarded Runner Up in the Australasian Auctioneers Championship. John is regularly asked to call some of NZ’s biggest charity auctions which include The Prime Minister’s Dinner, A night with Richie McCaw and Dan Carter, an Andre Agassi event and most recently, Simply Nigella Lawson. Your property is in good hands when you choose to auction with John Bowring and the Professionals Inner West team.